Image courtesy of Weinstein A+U The 430-unit Midtown Commons mixed-use apartment development received approval from the East and Central Area design review boards on Wednesday, March 13. After four rounds of critical review of the Midtown Center superblock redevelopment, Lake Union Partners received the green light on Wednesday to proceed with the master use permit process. LUP principal Pat Foley tells MPT plans are to begin the two-year construction of Midtown Commons on July 15, starting with the demolition of existing commercial buildings at the southeast corner of 23rd and Union. A contentious project among longtime Central District residents concerned about their quickly gentrifying neighborhood, Midtown Commons is a seven-story mixed-use development that will spread 430 apartment units across three buildings. About half of those are proposed to be priced at affordable housing levels for incomes between $28,000 and $60,000. The northwest building will have a 12,000-square-foot drug store anchor tenant, which is expected to allow LUP to offer smaller retail spaces at below market to minority-owned businesses. The Midtown Commons design team had its last presentation before both the East and Central Area design review boards in December. The boards joined forces to address the large development after residents protested last July that the East Design Review Board was not representative of the neighborhood, as its members are mostly white architects from Capitol Hill. The Central Area Design Review Board had just been formed at that point. LUP hosted three community open houses last fall to help inform a refreshed design that better represented the neighborhood and its strong African-American roots. But the East and Central review board members agreed during a second recommendation meeting in December that the design relied too heavily on art and that they lacked enough information about its context and function to pass it through. Board members said during the third recommendation meeting on March 13 they were put more at ease by the addition of Vivian Phillips as the project’s communications and arts advocacy lead. Phillips is a former member of the Historic Central Area Arts & Cultural District, which will be engaged in the outreach and artist selection process from start to finish. “They’re very eager to be a participant in this project,” Phillips told the joint board. 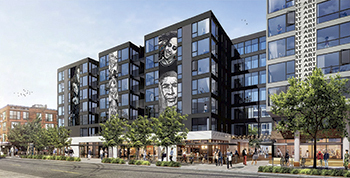 After reviewing feedback gathered at the three open houses, Phillips concluded that Central District residents want to see art symbolic of the legacy of that corner that also generates continued community engagement. Phillips and HCAACD will conduct targeted outreach and establish a partnership network of local arts groups, including the Northwest African American Museum, Langston Hughes Performing Arts Center, Black Dance Collective and Central Area Arts Commission. There are eight opportunities for art in Midtown Commons, including along facades and its three pedestrian portals leading to a 16,000-square-foot central plaza. A long-term communications plan will be established that includes electronic and printed updates ahead of the formation of an advisory panel to assess artist applications, which will be due in September. Artists are slated to be announced in December. Phillips said artists will live in Seattle or have strong ties to the Central District, and will have experience working on projects with communities. Central Area Design Review Board member Sharon Khosla said she was happy Phillips had been attached to the project and will provide accountability for the art programming. “That’s not in the [design] packet, and that needs to happen,” she said. EDRB member Andrew Haas said he wanted to make sure there was no branding art in Midtown Commons, which the boards agreed to make a condition for their approval. While the artwork is expected to be long-term, EDRB chair Melissa Alexander said she likes the idea of it being changeable over time if a concept doesn’t work. Late artist James Washington’s Fountain of Triumph is still planned to be relocated to a plaza at the corner of 24th and Union. The James and Janie Washington Foundation, which is overseeing the artwork’s restoration, previously provided a letter agreeing with its proposed placement. It had originally been sited along 23rd Avenue, near Earl’s Cuts and Styles. Tom Bangasser, who managed Midtown Center for 50 years and commissioned the fountain piece, pushed for the fountain to be placed in the center of the public square and that the intent of the piece — Martin Luther King Jr.’s dream, integration, and segregation’s impact on community — be fully realized. “Let’s give the man the honor that he deserves,” Bangasser said. Review board members agreed that they would like to see the fountain’s intent fully realized, but were fine with it remaining at the corner of 24th and Union. EDRB member Alastair Townsend said he’d like to see the sidewalk pavers have a better connection to the fountain, noting the intricate paving pattern in the public square; all lines leading to a significant tree near its center. Khosla expressed concern about a lack of artwork planned further down 24th Avenue, near where Midtown Commons would meet the future site of a development being created by Africatown Plaza LLLP, a shared entity of Africatown Community Land Trust and Capitol Hill Housing, which secured $4.5 million in city funding to help purchase 20 percent of Midtown Center from LUP. Landscape architect Todd Bronk with Berger Partnership said the design team is working with the James and Janie Washington Foundation to spread a number of Washington’s unfinished sculptures in its streetscape and landscaping along 24th Avenue. Board members also approved of changes made to the three pedestrian portals planned at Midtown Commons, which include planters and raised wood decks as focal points to draw people in. A planter in the 24th Avenue portal will spill out onto a portion of the sidewalk, near the delivery truck loading entrance, for added safety. The board approved of two new departures that will allow for constructing townhomes along 24th Avenue, a pedestrian-designated zone that under code would only allow 20 percent of street-facing facade to be residential.